Teachers love the authentic, "from-the-trenches" insight that Kristi McCullough offers during her professional development sessions with K-5 teachers. Her own experience as a reading and writing teacher and literacy coach provides the perfect backdrop for Kristi to share practical ways to deliver research-based best practices. As a full-time literacy consultant with Smekens Education, Kristi has worked with thousands of teachers across the United States delivering regional seminars and customized on-site school trainings that focus specifically on teaching reading. In addition, she is also the author of the "6-Week Planning Guide for Launching the 90-Minute Reading Block," a popular resource for K-5 teachers. Kristi wore many hats in public schools for 13 years during which time she was trained in Reading Recovery and many other well-known instructional models. She is passionate about helping teachers implement a balanced literacy approach focused on real-life, purposeful literacy activities that result in improved student achievement. Complete the form below or call (888) 376-0448. 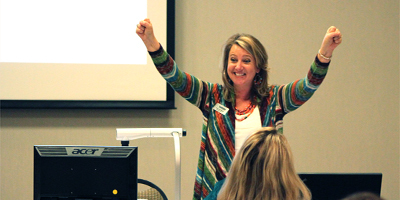 We're eager to help you achieve your professional development goals in literacy!